← Been a long time! Despite being so busy with real estate over this winter, I did get out ice-fishing a few times. The mild start to winter didn’t help things along – good ice didn’t form until well into winter. Oh, some were out fishing before me, but I just don’t like the idea of falling thru a sheet of ice, so I waited until I was comfortably sure my ground was safe. My Christmas present to Greg was a new ice shanty – and was it nice to have! Very cozy inside, especially with the propane heater going. 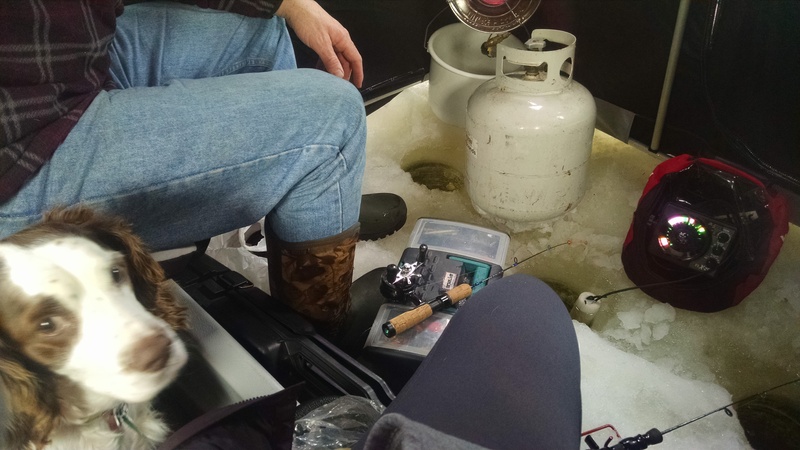 Since I was so busy working all the time, Greg and Dolly ice fished a lot while I was at the office or showing properties. After all this time, Dolly believed the second chair in the ice shanty was hers, and hers alone. When I came along, she was banished off the chair and had to sit in the tray between the seats. She was not happy about this scenario, as you can see by the look in the above picture. All in all, we got a lot of decent crappies through the ice this winter. They are the best eating fish ever – I could easily eat these almost daily. I’m looking forward to next season, even though we are at the start of summer as I write this. This entry was posted in Ice Fishing, NORTHWOODS LIFE and tagged chippewa flowage ice fishing, ice fishing in hayward. Bookmark the permalink.